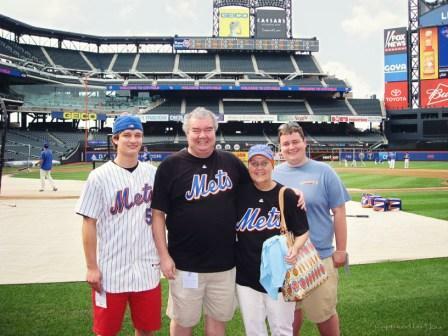 Susan O’Donnell is an avid sports fan who has loyally followed the New York Mets all her life. Just as the team has had its ups and downs, so has she. Susan has been fighting multiple myeloma, a blood cancer that can be treated but not cured, for nearly five years. After numerous drug and chemotherapy regimens and a prior stem cell transplant, doctors advised Susan that her best chance at a longer remission was a dual or tandem transplant. This treatment involves two courses of high-dose chemotherapy that are each followed by a stem cell transplant. 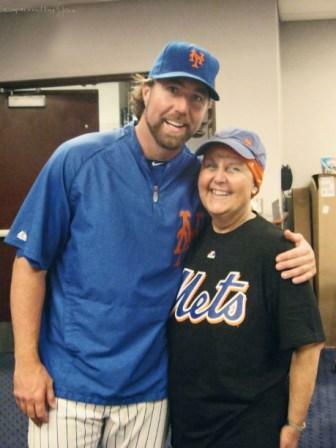 The Bone Marrow Foundation decided to try and do something to turn that thought into a reality, and the New York Mets organization graciously assisted in creating a special day for Susan. Not only did she return to Citi Field to watch the Mets play, she and her family had the opportunity to be on the field during batting practice, surrounded by her beloved Mets players. 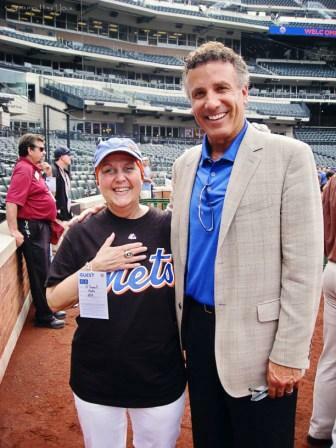 As she watched some of her favorite players such as David Wright, Ruben Tejada, and Ike Davis take batting practice, she was greeted by Bob Ojeda, who pitched for the 1986 World Series Champion New York Mets team. Bob took some time to get to know Susan and allowed her to try on his World Series Championship ring. Susan proclaimed “what a boost!” after the thrilling interaction. Her excitement reached a peak as R.A. Dickey came out and met her with a hug. He then took the time to listen to Susan’s entire treatment journey and get to know her family. He asked questions about the transplant process and offered her encouragement for the future. R.A. Dickey has been an inspirational and captivating player on and off the field. He does his best to provide momentum for his team, but he has now also done that for Susan. During an extremely challenging time, he has provided an amazing and exciting memory for her and her family. The New York Mets lost 13-0 to the Miami Marlins that night, but as a dedicated Mets fan, Susan stayed until the very end of the game. The following day, R.A. Dickey pitched his fourth complete game of the season, led the Mets to a 6-1 victory over the Marlins, and earned a National League-leading 15th win, which matched the most wins of any pitcher in Major League Baseball. Most importantly though, for the O’Donnell family, this continued to provide Susan an exciting distraction as she continues to fight her cancer. To learn more about Susan and her family click here.